It had to happen eventually. Justin Peck has served as New York City Ballet’s choreographic crown prince since the success of his Year of the Rabbit in 2012, justifiably winning accolades for his originality and choreographic craftsmanship. However, Peck’s latest ballet, which had its world premiere last night, is, at best, disappointing. Despite occasional highpoints, The Most Incredible Thing is not the most incredible ballet. With respect to the other pieces on the program, one dance and one performance are particularly notable: the return of Christopher Wheeldon’s Estancia, and the performance of Indiana Woodward, an exceptional member of the NYCB’s exceptional corps, in The Blue of Distance. My initial impression of The Most Incredible Thing, which I expect to see again from a different vantage point, is that the choreography, while at times very good with respect to large groups of dancers, is generally mediocre. That having been said, mediocrity is relative, arising here from perhaps greater expectations than were warranted. And placing it in critical context, on initial viewings I also found George Balanchine’s The Firebird somewhat tedious. 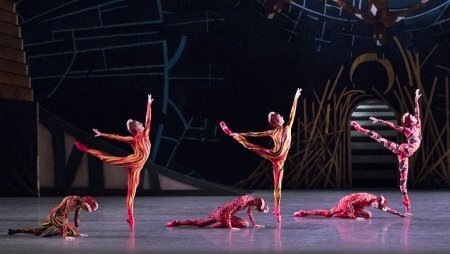 But I continued to see it to visually inhale the dazzling Chagall sets and costumes, eventually growing to appreciate the ballet’s ambiance and individual performances. I suspect that Peck’s new ballet may ultimately have similar appeal. Children, as well as adults, will be dazzled by the costumes created by Marcel Dzama, who also is the artist featured in NYCB’s annual art installation this year, and ‘dazzle’ – especially combined with the presence of cute-as-a-button student dancers – sells tickets. Dzama’s costumes are (with a few exceptions) magical, inventive, whimsical, and gorgeous. And unlike the costumes created for Peter Martins’s Bal de Couture and his version of Swan Lake, they don’t get in the way, or look inappropriate or just plain weird. On the contrary, they’re a feast for the eyes. Not unlike other fairy tales, with or without fairies, Andersen’s 1870 short story has a dark side, but ultimately an uplifting result. The king has decreed a contest to find someone who can do “the most incredible thing,” with the winner to be awarded a chunk of the kingdom as well as the hand of his daughter. As the story begins, folk of all ages gather to demonstrate to the king and a panel of judges that they can do the most incredible thing. Some of these ‘incredible things’ are fairly gruesome; some simply inane. One of them, however, is a magnificent hall clock from which lifelike moving figures appear and herald each particular hour. All agree that this work of art is ‘the most incredible thing’, and that the clock’s creator, a worthy boy of high repute, should be awarded the prize. But just as the young artist’s victory was to be proclaimed, an angry man suddenly appears, tall, bony and arrogant, and with his axe shatters the clock and the figures within. The judges, the king, and his subjects, who seem quick to change their respective minds, declare this man the winner because his act of destroying a great work of art is ‘the most incredible thing.’ But at that point the clock figures magically return to life, the clock’s artistic spirit is restored, the judges reverse themselves again, and the worthy boy is proclaimed the winner. It’s the right decision, no one is envious or disappointed, and Andersen’s narrative concludes that that – the absence of envy or violence – is really the most incredible thing. Some say that Andersen’s story was a response to the cultural disintegration and violence he saw that led to, and was a consequence of, the Franco-Prussian War, which was formally declared the same year that The Most Incredible Thing was first published. The ‘libretto’ for Peck’s ballet plays the Andersen story relatively straight, with dances by the hourly figures, which comprise the bulk of the piece, presented as a series of divertissements bracketed, at the ballet’s beginning and end, by pas de deux. But he also alters some characters and dispenses with part of the story. The Andersen tale infuses the figural representation of the hours with religious overtones (for example, one o’clock is a figure of Moses ‘writing’ the First Commandment; at twelve o’clock Jesus appears as savior). Peck and his team, perhaps wisely, have made all the figures secular (although the final ‘hour’ is titled Deity). No harm there. But the sense of a larger context (the ‘contest’ with other participants; the community-wide celebration) is jettisoned. The ballet’s overall impression might have improved had it not been. That the ballet essentially is a series of divertissements in search of something to happen doesn’t help. The greater problem, however, is with the music and the choreography, and that The Most Incredible Thing never overcomes its needlessly gloomy beginning. Bryce Dessner, who composed the commissioned score, is a well-respected contemporary composer, and parts of his score are vibrant and passionate (though too much of it, particularly when it works very well, is remindful of Philip Glass). But the ballet’s overture is a miasma of sounds that lacks any recognizable form. Notes are played (intentionally) off-key, with a sense of atonality, and blended as if attempting to create an aural haze – the musical equivalent, perhaps, of passing through dark clouds into a fantasy world. It’s painful to listen to, and a poor introduction to what’s supposed to be a fairy tale. And for a while, it doesn’t get much better. When the overture mercifully ends, Dzama’s phantasmagorical curtain becomes a translucent scrim, eventually fading into a vast, relatively empty space, looking as much dungeon as castle. There, the King (portrayed as a rigid, armor-clad twin-like being), having already announced the contest, hears the Creator (Taylor Stanley) explain his marvelous clock. Intrigued, the King introduces his daughter, and the Creator and the Princess share a romantic, but passionless, pas de deux. That this is their introduction to each other, the Creator hasn’t formally won yet, and her daddy is watching may explain the lack of ardor. But it comes across as simply unexciting. Not even Sterling Hyltin’s Princess, clad bewitchingly in an aristocratic silver-grey tutu and bodice, can breathe life into it. But the King wants to see the clock work, so the hourly characters emerge and dance sequentially. Tiler Peck begins (at one-o’clock) as a Cuckoo Bird, costumed like a strange-looking Firebird on steroids and moving like a hyperactive…cuckoo bird. At least the musical and choreographic pace quickens. But the pace slows again as Adam and Eve (Rebecca Krohn and Adrian Danchig-Waring) make first contact (nice to look at and nicely executed), and becomes tedious as the Three Kings dance robotically to lifeless choreography. After relatively exciting divertissements for Four Seasons and the Five Senses, the piece returns again to mediocrity with the appearance of the Gambler at six o’clock. Daniel Ulbricht does a fine job jumping and rolling around incessantly like a jester without portfolio, but the choreography, like that for many of the divertissements, is internally repetitious, and he’s costumed as a die (the ‘six’ connection is that the die always comes up ‘six’), with the black-dotted, bag-like white fabric surrounding his torso and effectively reducing his legs to stubs. Peck’s ability to move groups of dancers interestingly and at times entertainingly is evident in the divertissements for the larger groups that follow, including that for the eleven prepossessing young dancers from the School of American Ballet. And the appearance by the Destroyer (Amar Ramasar) briefly brings the ballet to life. A sleekly-costumed Carabosse who waves his magic wand of an arm (lengthened into a bludgeoning weapon), the Destroyer dispatches the dancing figures and figuratively smashes the clock, and his devilish pas de deux with the Princess, with his big club arm a semi-independent participant, is the neatest pairs dance of the piece. But by then it’s too late. The audience response when The Most Incredible Thing concluded was relatively restrained by NYCB ‘world premiere’ standards. No standing ovation; limited curtain calls. To the contrary, at the world premiere of Estancia, which Wheeldon created for NYCB in 2010, most of the audience in the orchestra rose to its feet at the dance’s conclusion as if electrified. The piece holds up as well today as it did then, and the central pas de deux has lost none of its complexity or warmth. Some say it’s too much like Rodeo, but that’s a superficial response. They have little in common except for both taking place in a romanticized West (in the case of Estancia, the Argentine pampas), the Alberto Ginastera score is soaring and crisp as fresh air, vaguely remindful of Aaron Copland, and the lead female character is somewhat of a tomboy. Tiler Peck and Tyler Angle remain as delightful in their lead roles as they were six years ago. Also on the program were repeat performances of three new ballets from the Fall, 2015 season: Polaris, by Myles Thatcher; The Blue of Distance by Robert Binet, and Troy Schumacher’s Common Ground. There were a few cast changes – of them, the most noteworthy was Woodward’s debut in The Blue of Distance. Her stage persona includes an innate lyricism and girl-next-door quality that can make her performances particularly captivating. As I wrote a year ago, in the way she moves Woodward brings to mind former NYCB principal Nichole Hlinka. And that’s high praise.